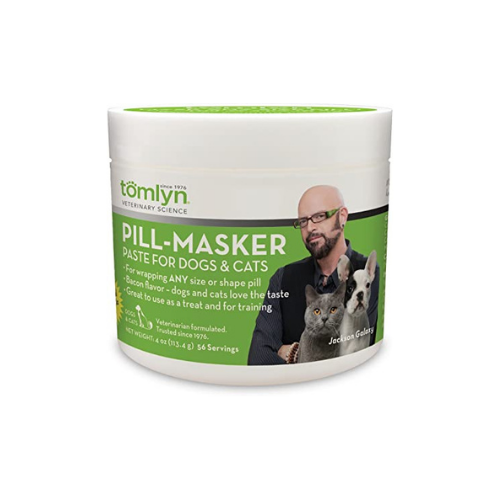 Pill-Masker from Tomlyn® is a moist, juicy, flavorful and shapeable paste that is perfect for wrapping around any size or shape pill. Pill-Masker makes giving pills to your pet easy! For wrapping ANY size or shape pill-more than 50 servings per container. Great alternative to pockets-doesn’t dry out when wrapping pills, Bacon flavor that dogs and cats love . Get a Pre-Loaded Display kit with Jackson Galaxy, The Host of Animal Planet’s My Cat From Hell, on the front is a real attention getter! The kit comes with 6 Pill-Masker jars and is refillable. It measure 6.5" wide x 10" high x 3.25" deep. Display can be placed on a shelf or hang from a wire grid to optimize space.